By February 1956, Mr. Hubbard had been in London for five months. His purpose was not only to consolidate the organizational structure of Scientology in Britain, but to update auditors on the technical advances of the previous two years while at the same time developing the “how” of dissemination to open the floodgates. And in all respects, the resulting response was an unprecedented success. On the organizational front, the Hubbard Association of Scientologists International had outgrown existing premises and moved to larger quarters in Brunswick House in bustling Palace Gardens Terrace. While simultaneously, dissemination was taking off, both in terms of the public’s awareness of Scientology and its application within the society. 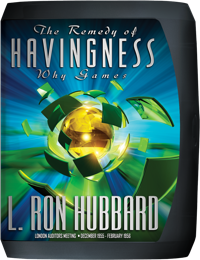 For with L. Ron Hubbard personally delivering a series of celebrated public lectures at the New Lindsey Theatre—attendance packed beyond capacity—he had also been receiving national recognition through newspapers profiling him as a “pioneer” into “the frontiers of the mind, and beyond.” While as for just how embracive his dissemination efforts were—it was typified by an archbishop, now also a Professional Course student, who was running the next-to-the-last list from Self Analysis on the congregation in the Ancient Catholic Church of the Good Shepherd in Chelsea. Yet even more notable, and of greatest importance to him, were the series of unprecedented technical developments throughout these few months. Specifically, in October 1955, Mr. Hubbard had begun delivery of the 4th London Advanced Clinical Course, where he lectured auditors on breakthroughs fundamental to all cases and trained them on an arsenal of new procedures. Then, with the ACC still at full throttle, he had inaugurated regular lectures—the London Auditors Meeting. 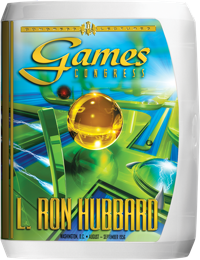 And with ACC graduates now applying the latest technology to a broad spectrum of preclears, combined with L. Ron Hubbard’s supervision of the instruction given to those London auditors, one factor was emerging as the linchpin in auditing: Games. Indeed, so important was this factor that Mr. Hubbard initiated the delivery of a very special Professional Course. 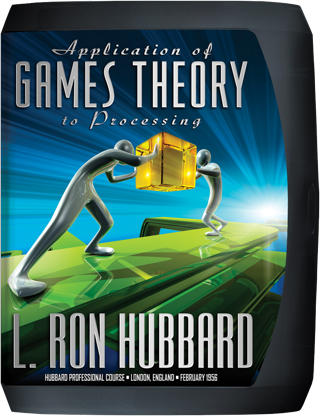 For whereas he had outlined the theory of games and its application in the London Auditors Meeting lectures, he now undertook to instruct students on the exact codification and application of Games Theory in processing. Indeed, it was technology so paramount to all auditing, it would culminate in the landmark, Scientology: The Fundamentals of Thought. Specifically, Life is a game. More important, and what Mr. Hubbard was impressing on those students, was the importance for auditing of a consideration that underlay practically the entire track—an individual must have a restriction to have freedom. “You say, ‘I want to make this preclear free.’ How do you make him free? At least give him one barrier. Evaluation—the definition of evaluation is trying to enforce on the preclear the reality of the auditor, which is not the preclear’s reality. “You’re an auditor. You’re handling the thinkingness and livingness of a person and so you can change their minds. And these things are theoretically true, but they don’t work out in the physical universe by dramatization and action. Just as a person can go on forever dramatizing a rage engram without ever wearing it out, so he can go on forever living in this universe without ever becoming sufficiently aware of it to plow himself in any other direction, see? So he could go forever, on an unawareness basis.